Dallas Area Expert Organizing Professional for All Areas of Your Home! More Space Place - Dallas is a family-owned and run business located in Carrollton, Texas. We strive to connect with our customers to learn their personal style in order to design the most customized and highest quality space-saving furniture our customers could hope for. Because we are family-owned, quality and customer-satisfaction of utmost importance to us. We'd love to connect with you for a complimentary consultation! We provide local delivery and installation. Out of state? No problem! We can ship out of state as well and can provide instruction and video installation assistance. Send us a message so we can get you a quote for your particular order. A professional organizing company based in the Dallas, Texas area. With a team of expert organizers, we offer both residential and business organizing services focused on creating order in your home, business, and life. "Get Organized!" has been featured on Good Morning Texas, Good Day Fox, CBS 11 and has an "A" rating on Angie's List. Dallas Area - Create a Closet That Fits You | Best of Houzz 2018! Tailored Living is North America’s largest whole-home organization company with over 250 locally owned franchises in the United States and Canada. We provide custom design of organization systems and white-glove installation services for closets, entryways, pantry, laundry, home office, mudroom, garage cabinets, hanging racks and slatwall systems. We are also the only authorized residential installer for Sika resinous decorative floor coatings. Our mission is to provide a personalized consultation, excellent customer service and superior installation that is right the first time. Need ideas? Check out our gallery. Whether this is your first project or your latest we would be glad to work with you. Give us a call today at 214-919-4199. MEET THE OWNERS Rewind to my previous life. It was a mess. Running around feeling like I was both coming and going. I can remember standing in my closet countless times wondering where “that sweater” was. Enter Tailored Living. My chaos was calmed as organization was brought to my home. Today our design team is excited to work with you to create a custom organization solution to tame your closet, pantry, home office, laundry room, garage or mudroom. Already organized but you want to be the envy of your neighbors? We collaborate with you to plan a 3D design unique to meet your needs and deliver white glove installation. Give us a call and book a complimentary consultation. Then, RELAX – WE’VE GOT THIS! We serve Addison, Dallas, DeSoto, Duncanville, Garland, Highland Park, Lake Highlands, Mesquite, Plano, Preston Hollow, Red Oak, Richardson, Rockwall, Rowlett, Sachse, Seagoville, University Park. I am a Master of Chaos. I enjoy helping my clients organizer their closets, downsize for moving and I specialize in helping seniors and their families with difficult downsizing and transitions. Million Dollar Rustic is the premier distributor of rustic Texas and Mexican home and office furniture. Our Dallas warehouse is stocked with bedroom furniture, office furniture, armoires, entertainment centers, bookcases, wall units, benches, bars and bar stools, dining room sets, occasional tables and upholstered furniture. Helping you organize your space so that you can focus on living the inspired life that you envision, while gaining a sense of peace and calm in your life. Services are confidential and judgement-free. Closet Karma is here to help organize your chaos. We not only organize your clutter, but we will help you to design a beautiful space to put it all in. 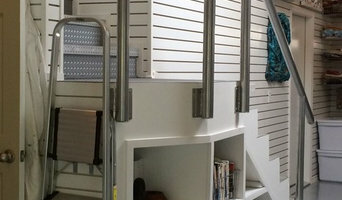 We specialize in closets, pantries and garages.